Lisa shared her story on what it was like to be on Oprah, Larry King Live, and the Today Show. Her passion and story resulted in a 7-figure advance for her new book.? Lisa told the crowd, “We are on a journey. We might get knocked down, but we choose to get back up.” ?Her candid story brought tears to both the speaker and the women in the room.? 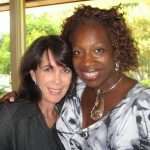 Lisa Nichols has helped thousand of women find their passion through her coaching. She is launching a reality show on WeTV, to help take women from a breakdown to a breakthrough, with her theme of “No Matter What.”?Casting is taking place now. What an honor it was to spend the day with Lisa Nichols.